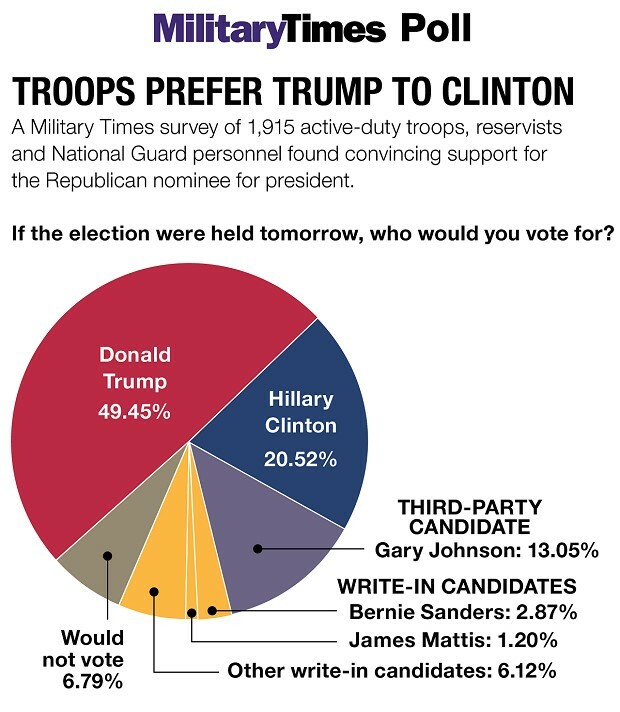 A new poll of American troops finds they are seriously bummed out about having Donald Trump as their next commander-in-chief, but even more deeply downbeat at the prospect of Hillary Clinton as their leader. While more than 61 percent of almost 2,000 active-duty soldiers, sailors, Air Force personnel, National Guard members and reservists surveyed by Military Times said they were “dissatisfied” or “very dissatisfied” with Trump, a staggering 82 percent voiced displeasure with Clinton. In fact, a surprising percentage of respondents – 23 percent – said they intended to vote for a third-party candidate. That is a higher percentage than the 20.5 percent who said they would vote for Clinton. Clinton did better with sailors, at 27 percent, than she did with the Marines who serve alongside them, winning just under 8.6 percent of the Jarhead vote. At 26.2 percent, officers were more inclined to vote for Clinton than enlisted personnel at almost 17.4 percent. But 28 percent of officers said they were more likely to vote for a third-party candidate. Overall, 49.5 percent said they would vote for Trump is the election was held the next day vs. 20.5 percent for Clinton. What Happens If Neither Clinton Nor Trump Get Enough Electoral Votes?